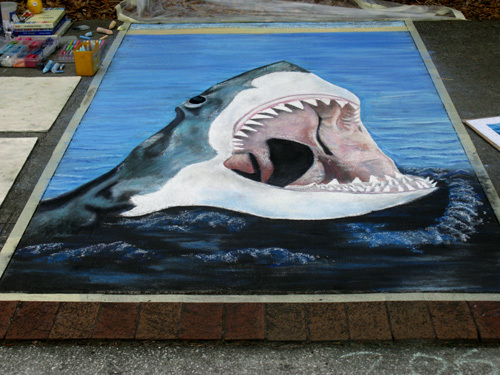 The Chalk Art Contest in Safety Harbor FL was held March 27-28, 2010. 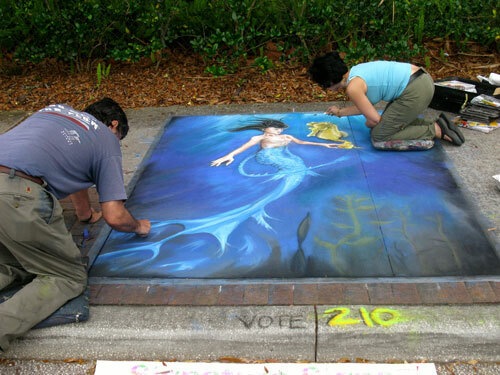 A lazy morning of street art makes for a cheap Florida beach vacation experience. 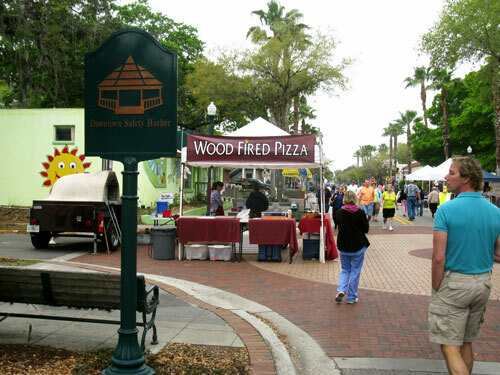 It was combined with the "Bloom N Garden Fest" and gave a bit of Renaissance flavor to this small town. 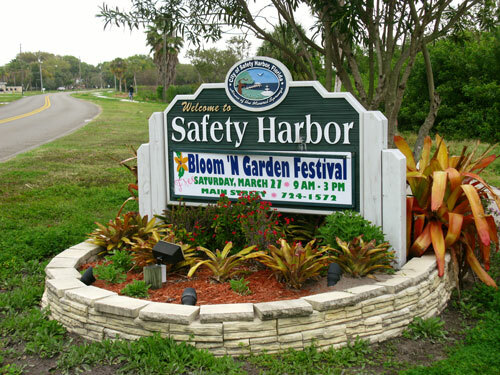 Safety Harbor is a little bay community of about 17,000 located on the west side of Tampa Bay. It's a "Mayberry" kind of town. 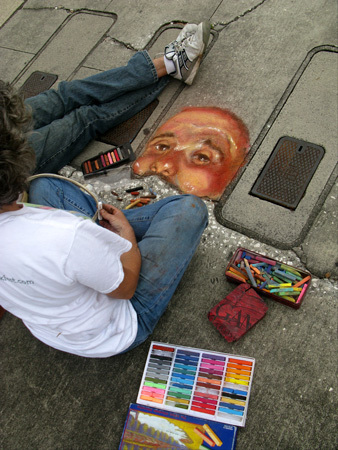 Main Street was blocked off for about 3/4 of a mile and about 90 chalk artists worked on a canvas of cracked concrete and fractured blacktop. 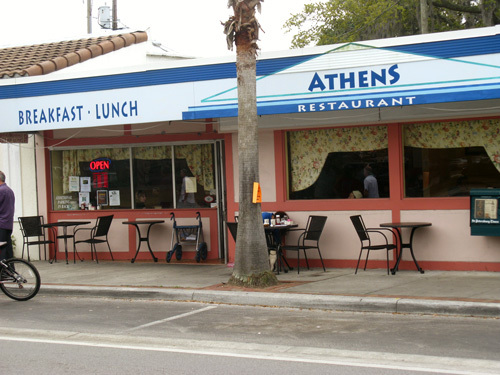 On Sunday, my girlfriend and I rode our bikes up South Bayshore Drive and stopped at our favorite breakfast spot, Athens Restaurant, to fuel up for a walk along Main to see the different creations. It was overcast and strongly hinting of a Florida thunderstorm, yet the artists worked carefree and didn't seem to notice. The contest opened at 10:00am on Saturday, March 27th and ran until 3:00pm Sunday...when it really began to pour. The pieces are created on site and they are not for sale. 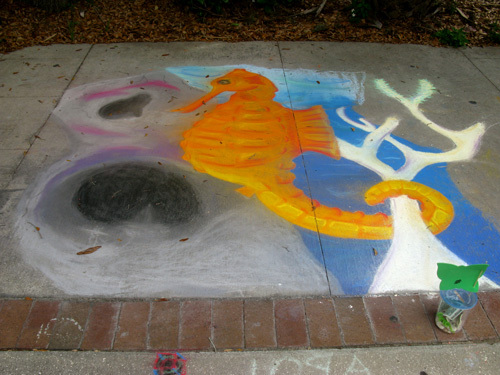 It's mostly a visual and educational experience for the viewers, however, the artists are awarded small amounts of prize money and are sponsored by the local businesses. Here's the marquee we saw on the way to Safety Harbor. At first, we thought we were there on the wrong weekend. 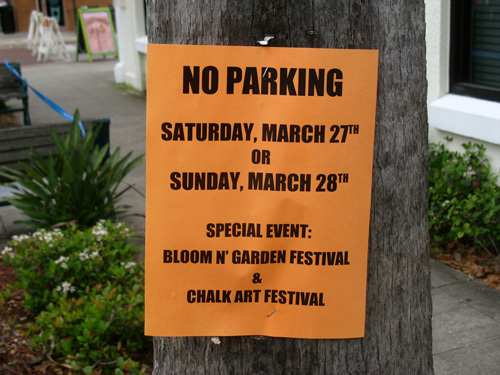 Fortunately, we saw these fliers posted on light poles showing the two events were combined. This "welcoming scene" was even more reassuring that we were in the right place. We parked our bikes across the street from our favorite small town breakfast place, the Athens Restaurant. 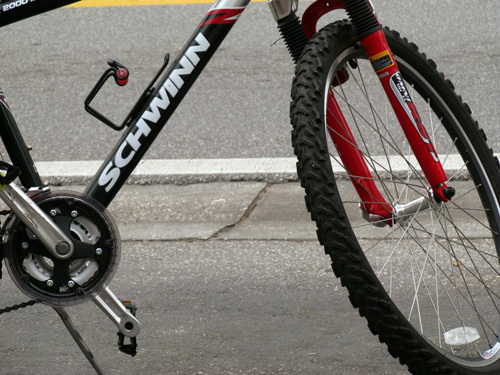 With Main Street closed for six blocks to the west, there was a lot of bike traffic in the downtown area. 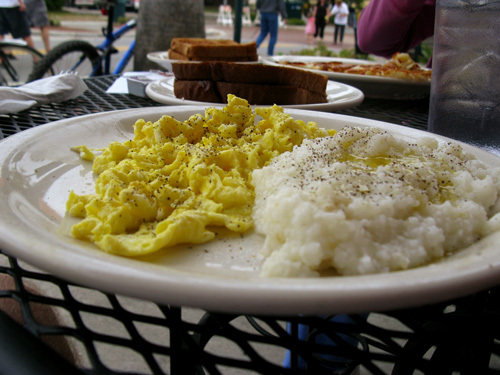 Two eggs, grits, and wheat toast still goes for under $4.00 here in Safety Harbor, FL...and it was definitely filling. 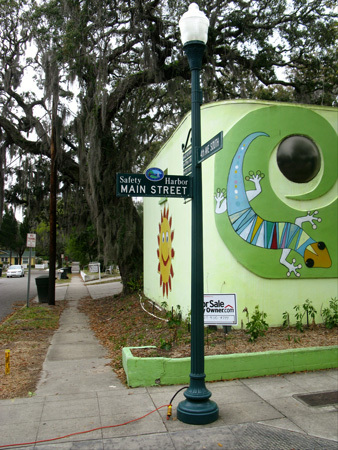 The "Old Florida" look of the signs and lamp posts added to the atmosphere. In the 20 minutes it took us to eat, several hundred more viewers showed up on Main Street. Most of the folks we talked with were visiting from the northern States and Canada. The first drawing we saw had a definite Florida theme to it. Right next to it, the theme continued. By the time we got to this mermaid, the pieces were a bit more calming. The detail on this tree frog was amazing. However, not every artist chose to stay with the Florida/Tropical Paradise content. Some opted to appeal to the youngsters in the crowd. 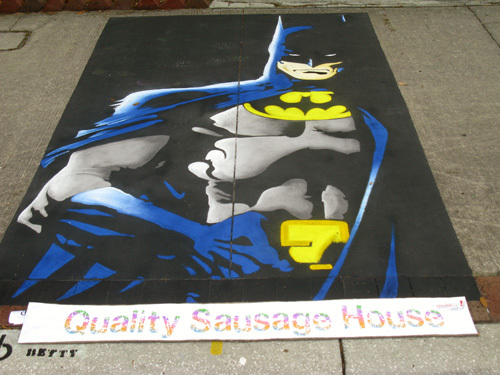 This Batman piece was outstanding. 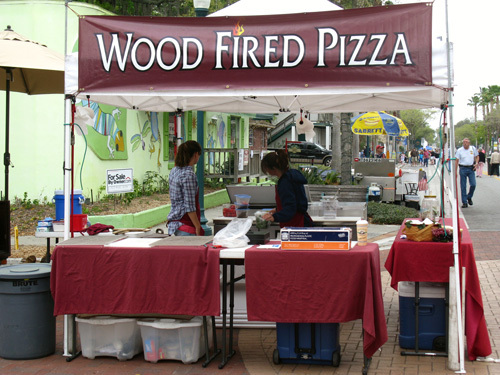 For people who came later, the wood fired pizza stand provided a great-tasting snack. 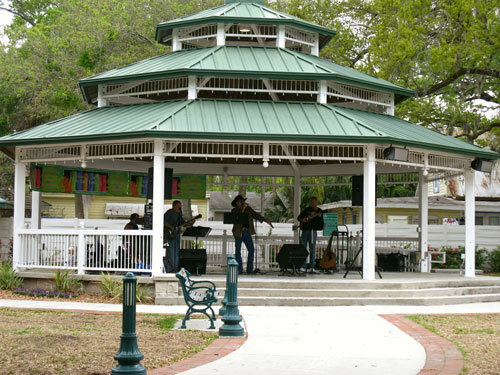 A country music band provided outstanding popular songs at just the right noise level. They were very good. 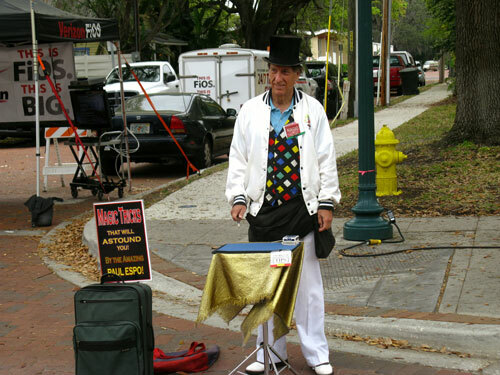 Paul Espo, well-known Bay area magician entertained viewers with a variety of card tricks and street magic. 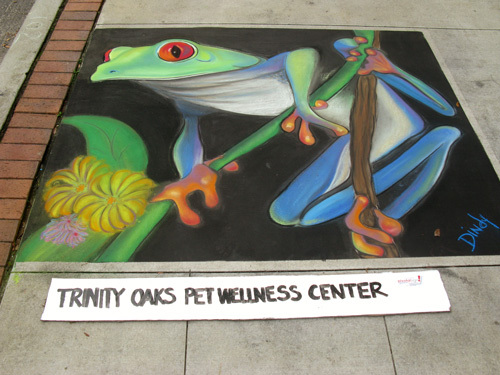 His easy-going and positive interaction made the Chalk Art Contest even better. As we were leaving to ride back home, we saw two artists relaxing...by sketching an impromptu subject in a broken area of Main Street. 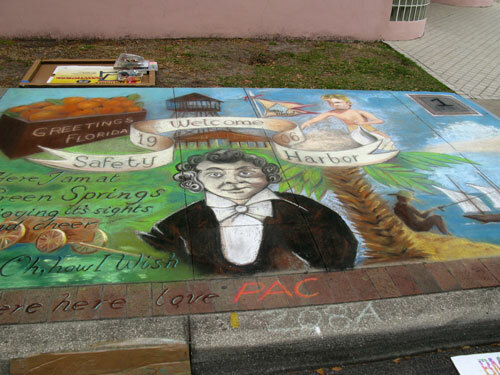 This seemed to put an exclamation point on the Safety Harbor Chalk Art Contest.